The original Donkey Kong was created by novice designer Shigeru Miyamoto in 1981, and quickly became one of the arcade's biggest hits, completely transforming Nintendo's fortunes. 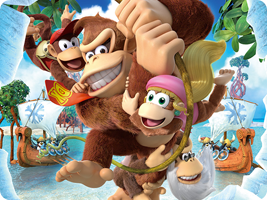 Over 30 years later, Donkey Kong is still one of Nintendo's biggest franchises, living on through the Donkey Kong Country series of platformers and the Mario vs. Donkey Kong puzzle series. Aug 1982 Arcade Donkey Kong Jr.
26 Oct 1982 Game & Watch Donkey Kong Jr.
15 Jul 1983 NES Donkey Kong Jr.